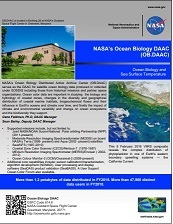 NASA's Ocean Biology Distributed Active Archive Center (OB.DAAC) is managed by NASA's Ocean Biology Processing Group (OBPG). OB.DAAC is responsible for archiving satellite ocean biology data produced or collected under NASA’s Earth Observing System Data and Information System (EOSDIS). OB.DAAC's holdings include a mixture of historical and current missions, as well as data from both NASA and partner space organizations. Supported sensors, related information, and direct links to data can be found on the OB.DAAC website. OB.DAAC provides access to data and information through the Ocean Color website. Users can visually search the ocean color data archive and directly download and/or order data from single files to the entire mission using the Level 1 and 2 Browser. 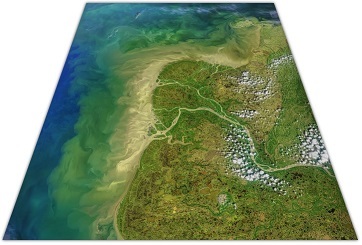 Using the Level 3 Browser, users may also browse the entire Level 3 global ocean color data set for many parameters and time periods and download either PNG images or digital data in HDF format. In addition, the Ocean Color Project maintains several HTTPS sites for the direct download of data for each supported mission/sensor. This webinar, held on 6/15/16 demonstrates the capabilities and use of SeaDAS (Version 7 and later), NASA's free and publicly available software which enables users from their standard desktop and laptop computers to process,visualize, and analyze remote-sensing data. During this webinar we will show you how to discover, access and visualize NASA's ocean color data products.